Maestro Rhydderch Derwen started in the SCA in 2010 in the Barony of Gyldenholt where he picked up a rapier and has not looked back. His first major event was GWW in 2010 Rhydderch Continues his training of historical technique with Don Lot Ramirez and is the Weapons master for the crew "The Sea Beggars" of The Beggars Inn. He was elevated to the Order of Defense by TRM Agrippa and Dawid on October 7th, 2018 at Great Western War. 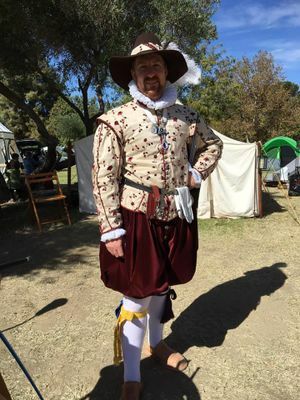 Rhydderch enjoys teaching classes on basic rapier techniques as well as historical rapier. This page was last modified on 4 April 2019, at 18:58.